Green Smoothie to Feel Better! It’s the first week of October; I’m pregnant, and already starting to get sick – UGH! I made it 34 weeks feeling completely healthy, but the start of cold and flu season apparently caught up with me real quick. In the past, I would go for an over the counter cold medication or take a trip to the doctors for antibiotics, but things aren’t so simple anymore. Unfortunately, when you’re pregnant, you’re so limited to only certain over the counter cold medications, which I’m personally still skeptical about taking. Instead of relying on medications, I went back to the old roots of home remedies. I have been a big fan of using coconut oil throughout my pregnancy and this healthy fat came in super handy while I was under the weather. Coconut oil is not only good for helping boost the immune system, but also has anti-viral and anti-bacterial properties. All of these three benefits are a wonderful addition to aiding in cold/flu prevention or relief. Oil Pulling – Having a sore throat is THE WORST! I have had multiple people tell me that they oil pull with coconut oil when they come down with a sore throat, so this morning I thought to myself – here’s your chance to try it. I took a tablespoon of coconut oil, which was in a solid state, and placed it into my mouth to swish around. Honestly, I gagged and had to spit it out. I melted down the coconut oil instead and proceeded to place another tablespoon into my mouth, which worked so much better! I was able to keep the coconut oil for 15 minutes and also found that it helped if I kept the oil in the front of my mouth. Within a few hours, the pain of my sore throat was cut in half and I will proceed to repeat this 2-3 times daily until better. Coconut Oil Vapor Rub – I personally don’t like store bought vapor rub because of how bad it stings my chest and nose, so I turned to making my own. A little coconut oil and essential oils can go a long way and I loved that the coconut oil would moisturize as it was applied. I also applied this rub to my nose, which helped with congestion and my cracked, red nostrils. Homemade Cough Drops – This recipe was so simple to make, with two ingredients – coconut oil and honey. Just like coconut oil, honey also has great anti-bacterial properties and some studies have shown that honey may help relieve cold and flu like symptoms. You can also make these into cough drop lollipops by laying down a candy stick and pouring the mixture at either end, allowing to cool on parchment paper. Smoothies – I’m the first to not want to eat when I’m sick, but I can’t tell you how important it is to keep eating, especially while pregnant. Smoothies are one of the best ways to get down fruits, vegetables and even protein if you decided to add a protein powder into your mix. Reach for fruits packed with vitamin C and green vegetables, such as spinach and berries for antioxidants. Add a tablespoon of coconut oil into your smoothie for added healthy fats! 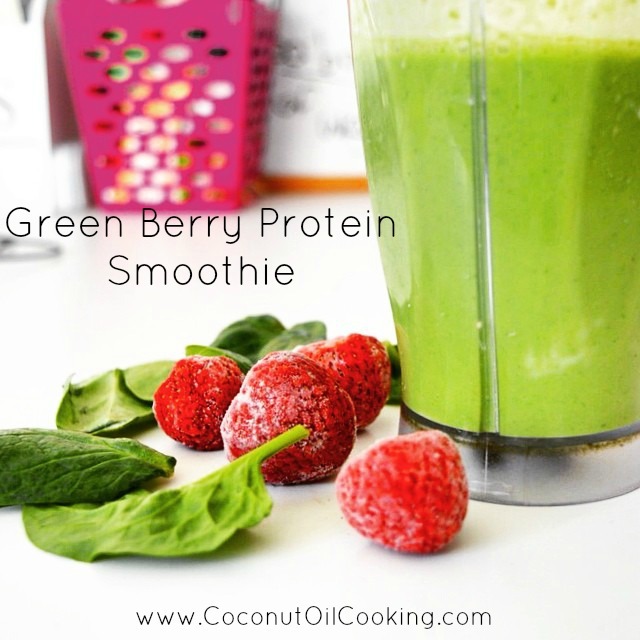 This Green Berry Protein Smoothie is my go-to recipe. I hope that some of these tips will help you while you’re pregnant and feeling under the weather. Even if you know someone who isn’t pregnant, these tips can still be used when sick. For more tips, be sure to check out our Top 5 Ways to Fight Cold and Flu.